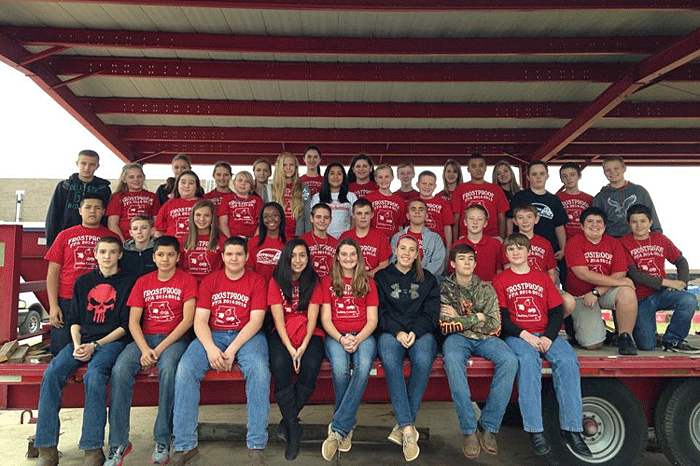 In the photo: Members of the Frostproof Middle FFA get together for a photo on FFA Chapter T-Shirt Day. THE NATIONAL FFA organization recently celebrated National FFA Week from February 21-28. Many local chapters had themed days for their members to participate and get others into the spirit. If a spirit prize was passed out for Polk County chapters, without a doubt, Frostproof FFA would have been handed the award. Each day, seniors shared an ag fact with the students of Frostproof High School and members wore something that stood out for agriculture. With an estimated 230 students (middle and high school combined) enrolled in an agriculture class, Frostproof FFA has over 60 active members on their roster. They have numerous Career Development Events, such as livestock judging, vegetable identification, parliamentary procedure, tool identification, and more. The members of Frostproof FFA also take the time to educate their younger generation on agriculture. This year, the chapter will be participating in Ag Literacy Day at surrounding elementary schools. They will also be hosting a “Food for America” event again at Frostproof Elementary School, where second graders will have the opportunity to explore different ways agriculture provides food for America. There will be different booths, such as small animal production, large animal production, and citrus. Plus, students will even get a chance to have their very own plant to keep. Aside from educating young children on agriculture, the members always make sure to keep their community first. The agriculture classes have planted different vegetables (like broccoli, tomatoes, and potatoes) under their new shade house. They sell all of their products to the faculty and the community so that everyone can have fresh, homegrown vegetables. Let’s just take a minute to appreciate the hard working members of Frostproof FFA Alumni. These adults work tirelessly to make sure that the members have the best experience possible while attending Frostproof Middle-Senior High School (FMSHS). If you aren’t familiar with Frostproof, as soon as you get to the red light, you know you’re in a small town where everyone knows each other. With orange groves on either side of scenic highway and cattle ranches throughout the town, you can tell agriculture is thriving in Frostproof. The Frostproof FFA Alumni has held its Annual Dinner and Auction for over 28 years. Every year, they have almost 300 people in attendance and sell around 600 dinners. All the funds collected go straight to the members for their summer camps and other events they like to do throughout the school year. Mr. Elliot Brantley and Mrs. Scarlett Jackson, the two FFA advisers at FMSHS, couldn’t be more proud of the hard-working members that they have had this year. They have brought home many blue ribbons to hang up in the classroom. How do they encourage everyone to be so active? Not like it takes much, but at the end of each year, the chapter rewards its active members with a field day at the Florida FFA Leadership Training Center. The kids have a chance to play volleyball, go canoeing, go swimming, and enjoy a day out of school for all of their hard work and dedication to the organization. If you can’t tell, Frostproof FFA has an awesome group of highly deserving members who do their absolute best every day. Do you know of a chapter that goes above and beyond and would make a great spotlight chapter? Email me your story and let’s share their hard work. ABOUT THE AUTHOR: Abby is the president of the Haines City High School FFA chapter and the voice behind 97 Country’s segment, “Ag Time with Abby,” which airs the first Friday of every month during the Breakfast Club with Roger and Melissa. Abby is also the 2014 Polk County Farm Bureau Youth Speech Contest Winner. For questions, FFA news, or FFA story ideas, email Abby at abbigailreis@gmail.com.